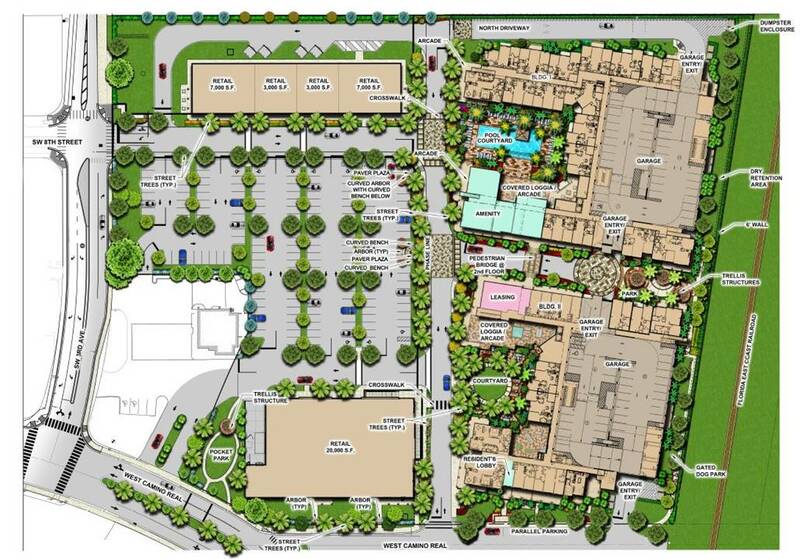 On April 8th, 2019 the Boca Raton Community Redevelopment Agency (CRA) will have a public meeting which could result in approval of 350 dwelling units in two, eight story buildings on the east side of a nine acre site along with adequate parking. On the western portion, plans are for two buildings designed for retail. A dog park and small pocket parks are included. The land owners are Florida Crystals and Kimco Realty. This is the old Winn Dixie shopping center site. According to Brandon Schaad’s presentation at the November 8, 2018 Planning and Zoning review of the project, it has been vacated since 2010. Some residents at the March 27, 2019 outreach meeting by the developers said they are tired of looking at the unoccupied buildings and needles on the site. 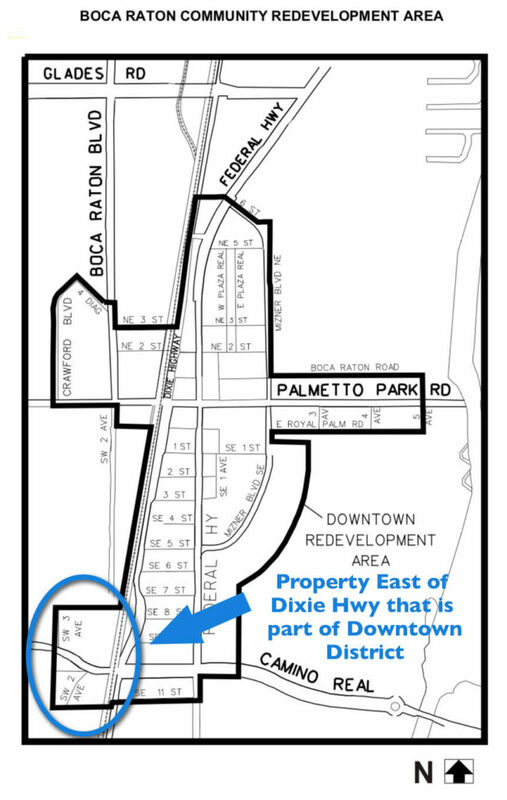 Many residents don’t realize that the downtown district includes a small area to the north and south of Camino Real just west of the FEC Railroad crossing at Dixie Hwy. This area includes the Fresh Market and Wallgreens plazas. 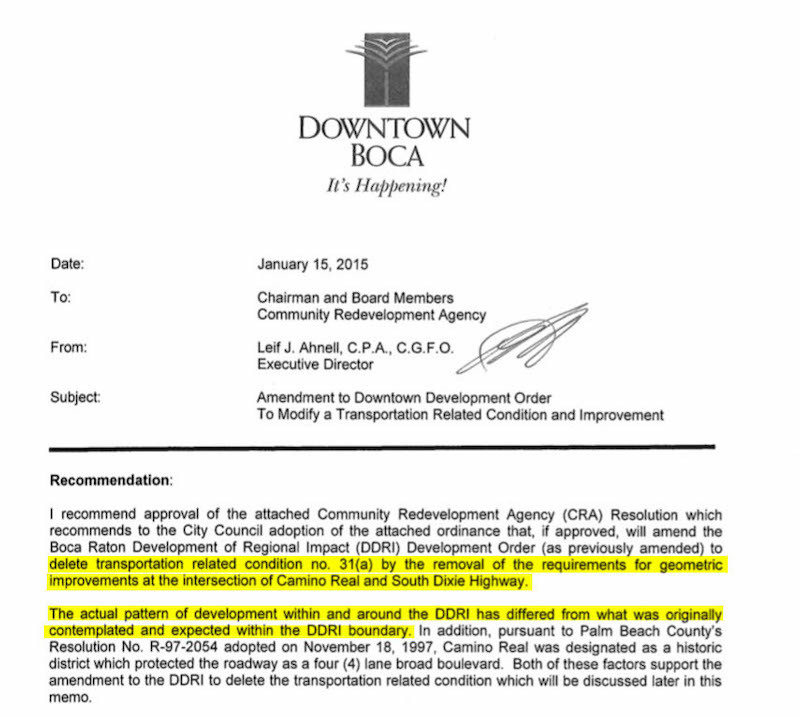 According to Florida Crystals/Kimco, the Camino Square project meets, and in some cases exceeds, the requirements of Ordinance 4035 which sets forth the rules for developments in this area. Examples they cite are open space, setbacks, building heights, parking, and some others. The developers are not asking for any variances at this point. School concurrency is 10 kids. The number one concern of residents is the safety and congestion issues at the 5-way intersection of Camino Real, Camino Gardens Blvd. and SW 2nd Ave. Like Palmetto, the railroad crossing is a choke point for cars, bikes and pedestrians. Intersections like this are notoriously problematic and this one is further complicated by the FEC and Brightline train traffic. No matter the best intentions of traffic engineers, a train crossing halts all the east-west traffic. The local traffic from the communities south of SW 2nd Ave and Camino Gardens are blocked from exiting their neighborhoods. The inability of emergency services to move through the area when congested is also a concern. To soften the impact of adding more residential traffic to the area, Florida Crystals/Kimco has proposed a plan they say was reviewed and approved by both county and city staffs. As shown in their diagram, they propose to add the 1988 recomended improvements that the CRA excused themselves from doing in 2015. The changes amount to adding two more east bound vehicle traffic lanes in the same space occupied by the roadway now. This is done by deleting the bike lanes, and shrinking the traffic lane width to 10 feet. One of the new lanes is an additional left turning lane. The other is a dedicated right turn lane to turn south on Dixie Hwy. The two remaining “middle lanes” go straight. The proposal maintains the single westbound lane they refer to as “free flow” lane. That is because it is not controlled by the light at the intersection. 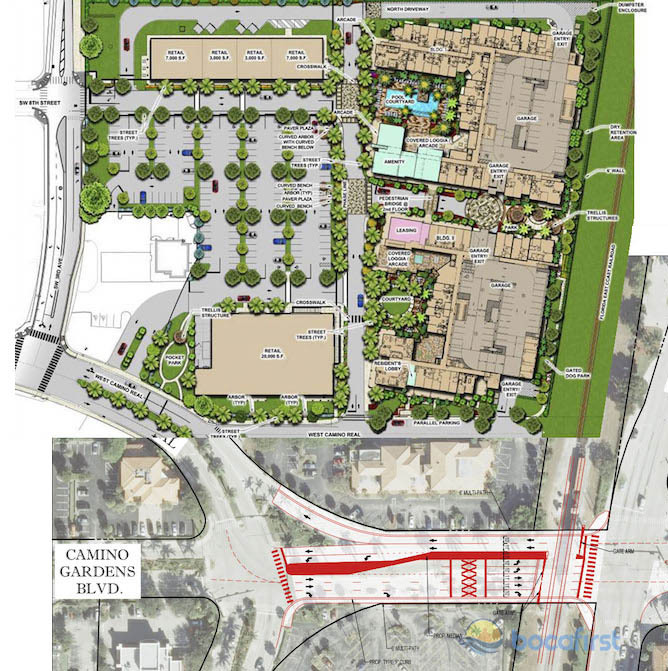 However, based on the proposed new development, the entrance to the southernmost Camino Square parking garage intersects this single “free flow” lane. It seems an oversight that the additional westbound traffic created by the project not only adds to the westbound flow but also stands to slow it down as cars brake for the hard right turn into the garage access road. The Florida Crystals/Kimco traffic expert claims that synchronizing of the lights at 4th Ave, 3rd Ave, 2nd Ave/Camino Gardens and Dixie will reduce wait times at the lights from 162 seconds to 71 seconds for a 56% improvement in traffic flow which, if accurate, is a major plus. Residents and businesses of the area pay the price while bypass traffic gets the benefit. It’s great that the traffic flow could be helped, but at what expense? The proposal to do the outdated 1988 improvements are simply cramming more cars into the middle of what is supposed to be a modern, mixed use, people friendly community of retail and residential. Residents and businesses of the area pay the price while bypass traffic gets the benefit. In order to solve the traffic problems, they have created a bigger problem for the business and residential communities. This section of Boca is a popular place to live due to walking and biking proximity to downtown and the beach. It is a popular biking route for people living as far away as SW 9th avenue and beyond. When the Intracoastal bridge is working, families and youth enjoy weekend biking to the beach using this route. With the existing roadway being modified for increased car traffic, space for a safe combination pedestrian/bike way must be found. The developer has committed to work with the community and the city to get it done. 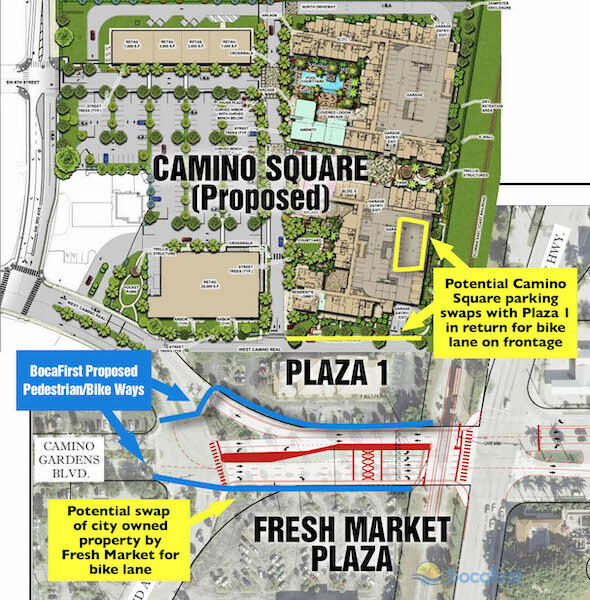 As outlined in the companion article “Camino Square: Bye Bye Bike Lanes?”, this is an opportunity for commercial property owners of the area to work together for their own good as well as the community they depend upon. Whether by car, bike or foot, owners of the Fresh Market Plaza on the south and Plaza 1 on the north should work with Florida Crystals/Kimco to create the space around this intersection for the community they depend on to access their businesses. Furthermore, the CRA needs to take a fresh look at their history managing this intersection. In particular, look to flow the monies collected back into the area. The CRA is responsible to these businesses and the community to provide the infrastructure needed. Many residents have been asking for years why won’t the city fix this intersection and its safety/traffic nightmare. Myself included. 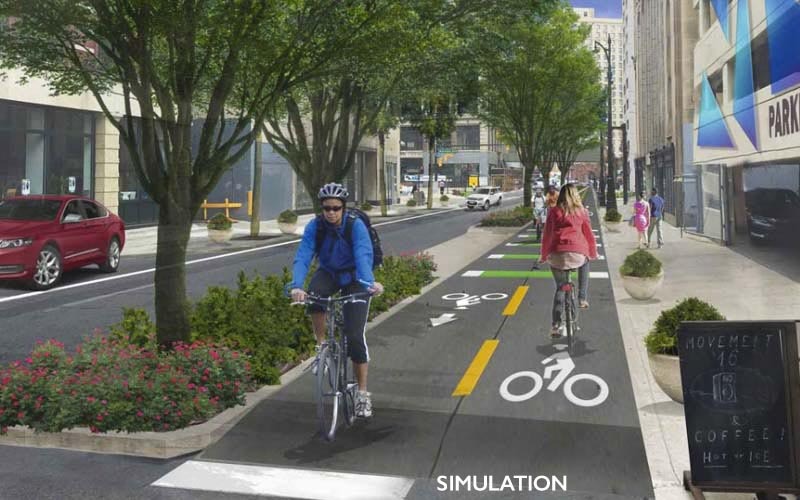 An improved roadway and comprehensive pedestrian/bike plan would be a win-win for all of us. In turn, a neglected area will be improved, traffic addressed and the needs of both public and private interests accommodated because they are fundamentally dependent on each other. I’d think it would result in improved property values for the area but only if the comprehensive approach that compensates not punishes the residents and businesses. The pedestrian/bike ways must be made a condition of the approval. Jack McWalter is originally from Chicago. He is a graduate of Loyola University. 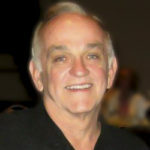 He moved to Boca 39 years ago and raised his 2 children who went thru Boca schools. He has 4 grandchildren. He is a Viet Nam era veteran and IBM employee for 32 years. For the last 10 years he has done charity work for special needs children. His passion are Boca kids. For the last several years he has been fighting against school overcrowding and for more security in Boca schools. He will continue.